Amazing creek access, friendly and quick responses from the management team. We loved how dog friendly the property was, we knew our pups could explore within the safety of the gated area around the house. Really enjoyed the large deck overlooking the creek. "epic place to relax "
Absolutely epic place to relax in the redwoods with endless places to explore within a few miles. (I highly recommend Bodega Bay, exploring the beaches close to Jenner, and the town of Guerneville) The views from the living area were impressive, which looks out on a creek and endless tall trees. The house was well appointed in every aspect. We used the fireplace every single night and it made for a relaxing few days. Sadly it rained (heavily!) the whole time we were in town, but this home was a perfect place to relax and unwind. We would definitely come back. "Casa Verde is really a gem!" Casa Verde is really a gem! Everything was just like in the pictures and the hot tub and the fire place really made some nights cozier. It’s a great house for dogs, since it’s fenced in and you can have your pooch run around in the back of the house. Even though my stay was in the middle of the storm, I quite enjoyed my stay at Casa Verde. I will definitely come back in the spring or summer time. "We had the best of both worlds"
My family and I were away from our home for a few months, staying in California over the holidays. Our apartment is fine but doesn't feel enough like home, so we turned Christmas into a staycation, and this cabin in the Russian River area was the perfect nearby getaway. It rained a lot so the deck was hard to enjoy, but the fireplace was lovely. When we could, we availed ourselves of the hot tub, and the rest of the time, enjoyed our proximity to both the beaches and the redwoods. We had the best of both worlds, plus wineries and just enough seclusion to take a needed deep breath. "would have loved to stay longer." This place is peaceful and just so cozy. I would have loved to stay longer. Great place to get away from the fast paced Bay Area. Wonderful place just to enjoy nature and the outdoors! "The perfect, surrounded by nature getaway." The perfect, surrounded by nature getaway. We spent a quiet weekend relaxing by the fireplace or in the hot tub. Loved the waffles! We would love to come again in the summer. Nice location, enjoyed the jacuzzi when we could through a rainy and cold weekend during thanksgiving. Furnace for the house stopped working after the first night we came and couldn't be fixed. Would recommend for summer cabin style and dog owners. The perfect, private getaway. We spent a quiet weekend here with our family. Great access to the creek, well appointed, highly recommend. "provided a zen and tranquil ambiance." My family and I, and our dogs, enjoyed our weekend getaway at Casa Verde. It’s remote location in the mountains away from the hustle and bustle of town provided a zen and tranquil ambiance. The kitchen is fully stocked. The jacuzzi is great working conditions. And the bbq pit was perfect for an afternoon feast. I was impressed with the quick responses from Maile who provided top tier service. We had an issue with the heater and Maile sent us a team to resolve the problem and also provided us with 2 additional space heaters. Thank you. Highly recommended and we will be coming back. "Nice, cozy spot in nature." Nice, cozy spot in nature. Lovely hot tub, fireplace and amenities provided. We loved the waffles and the bottle of wine. "Casa Verde is an absolute gem!!" Casa Verde is an absolute gem!! It's modern and stylish while still maintaining a relaxed cabin vibe. It is very close to everything you want to do in the Russian River area, while feeling remote and very private. The beds were comfortable and house had all the amenities you would expect. The deck was a perfect place to relax, drink your morning coffee or stargaze at night. The hot tub was an amazing way to end our days at Casa Verde, which we're entirely too short. We hope to come again! This house has a nice location right on the creek. The deck was great for lounging & sunbathing. The house had all the amenities one might need for a longer stay. "Casa Verde is pure bliss!" Simply fabulous! Casa Verde was everything we hoped for and more. We were looking for privacy, a yard for our dog to run free and water for her to swim, Casa Verde delivered. The home is located behind an eight foot gate and once it's closed you are in a very private getaway with the exception of one of the homes next door. This wasn't a problem for us because there was no one in the home at the time of our visit. Our dog is dog reactive so we wanted complete privacy to avoid any interaction with another dog. If someone with a dog had been in the rental next door it could of been a nuisance as there is complete visibility into the neighboring yard from the corner of the deck at Casa Verde. When booking we asked about the proximity of neighboring homes and learned it would be vacant at the time of our visit so it wasn't an issue. There are only a couple of other thing worth mentioning: 1) if you're sensitive to noise the roads in front and behind the home are well traveled, even in the middle of the night; and, 2) there is absolutely no cell service but the owner does suggest forwarding your calls to their land line phone. Neither of these bothered us at all and would not deter us from returning to this fabulous home. It's well equipped with all the comforts of home... plenty of linens, comfortable beds, well stocked kitchen with every pot, pan, utensil and dish imaginable, with that being said next time I will bring paper plates and plastic silverware because we ate in for every meal and since there is no dishwasher I felt like I spent a lot of time washing dishes. In summary, it's an amazing property... comfortable cabin feel but modern, well fenced and gated so your pup can run free, located right on the creek which had plenty of water and swim holes to cool off and a hot tub to warm up among lots of beautiful redwoods. We can't wait to return!! Great place, great location. We had a great time, thanks! We had a lovely few days at Casa Verde playing board games, watching movies and hot tubbing in the rain. We would love to come again in the summer! Wonderful property with access to the soothing creek and a fenced in yard that clearly was done with dogs in mind. Would stay again. Live in SF and want the perfect weekend getaway? This is it! May I add, it’s a cyclist paradise. Can’t wait to go back soon! "Casa Verde was beautiful and serene"
"The house we stayed in was really nice. HAd a fireplace and was very comfortable." House was very well maintained and very easy to access. We loved the location and how comfortable we felt. The fireplace got smoky and we were not certain why. Other than that we loved it. It had board games, movies and card games if interested in that. We cooked breakfast at the house and found the amenities good. What a nice place to get cozy on a cold fall weekend. Hot tub and fireplace were a hit with our family! Thanks! My husband, 4 year-old son, and I had a great weekend at Casa Verde for our 10 year anniversary. The creek was beautiful this time of year, with yellow trees dotting its banks, and we were able to both splash in it and walk along it for some distance. The hot tub was just heavenly under a bunch of redwood trees and so lovely to sit in there on cold weekend mornings. The decor in the house is cottage-y and not too rustic (a good balance) with a beautiful stone fireplace. The fireplace did create a smokey cabin; it seems it could use some glass doors or some enclosure to help it function better (so the smoke goes up instead of out). Landscaping is beautiful, interesting and lush with an outdoor fire pit (although it's starting to crumble apart). Gorgeous, high creek windows that we enjoyed looking out of while drinking our morning coffee. It was perfectly zen and a great locale to zip out to Jenner for dinner at the coast. We would have liked for a dishwasher because I was kind of hoping to not wash dishes on my anniversary weekend :) But overall a truly lovely spot. We'd come again. Beautiful and peaceful setting. Fenced yard which was great for our dog who enjoyed exploring. Home was comfortable and cozy. Two couples and our dogs. The home is beautiful and comfortable. We enjoyed eating on the deck and listening to the creek, and soaking in the hot tub. We sat by the fire pit in the afternoon as it is very shady and cool. We walked the dogs across the creek every morning and walked them on Austin Creek Road. We visited Jenner, Duncan Mills, and Bodega Bay. At least at this time of year, it became very hot indoors when the sun came in, but cooled off later in the day. I would definitely book this home again. "A beautiful, well appointed cabin..."
A beautiful, well appointed cabin with lots of privacy and a lovely creek that provides wonderful opportunities to meander up and down it with young children or on your own. Fabulous, sweet place. Just stayed in Casa Verde for the 4th of July holiday 2017. This is my 2nd time staying at this home, the location is fabulous, there's a 1.3 mile road right across the street that's a fabulous walk or run along a small creek! It has a fenced yard for your dog and a private path to Austin Creek. The deck is awesome! There's a couple of things for the owner I'd like to share. Under "Amenities", I would suggest stating that your BBQ is Charcoal. In the photo you have now, it looks like a gas grill so we didn't bring charcoal and there was none at the home when we arrived. We had four people in our group and there are only 2 coffee cups left in the house so we had to drink coffee out of the small bowls - but other than those two small things being fixed, the house is great and I would stay there again! Thank-you! "Sweet house shaded by trees"
Beautiful home with more room than you think and perfect outdoor space. Great for family to get away but not be too far away from town. "A wonderful, well kept cabin." My then girlfriend and I stayed at this property back in 2011 with our dog. It was a memorable experience, and we've since tried to book the cabin to no avail, so you can imagine how excited I was when I found out it was once again available. This time, with my now wife and two kids. It brought back old memories of our stay and our beloved dog; it was bittersweet. We were also able to go visit the log over at the Russian River Gulch where I carved our dog's name in it. It was still there! The cabin was a bit colder than I remember it to be, but nothing a little fire and a heater couldn't fix. The place is still big enough to accommodate a family of four; our kids had a blast; we grilled a locally procured trip tip roast from the local general store that was out of this world. An enjoyable experience all-in-all had it not been for me catching a cold toward the end, even with that, it was still fun! Honestly one of the best vacations ever! The house was perfect for the four of us plus the poodle. Thank you! We will be back!! The property exceeded all expectations! Great area, beautiful scenery, and Casa Verde was even more beautiful than the pictures showed! We will be back! The access and check-in was seamless. The I-Phone app was a big plus. The house was terrific. Kitchen was well stocked. Beds were comfortable with plenty of pillows. A very comfortable home with a feeling of seclusion. "We had an amazing time at this house"
We had an amazing time at this house. The coziest little cabin in the woods! 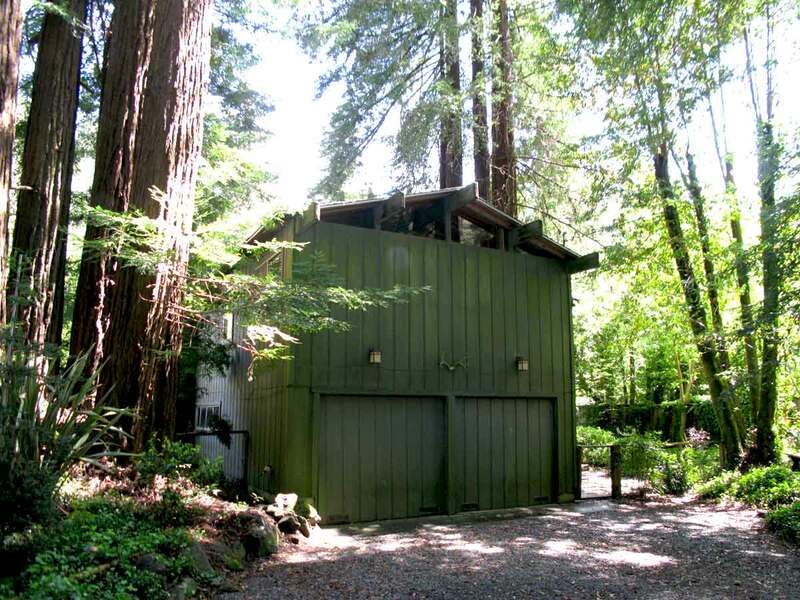 The home itself was very unique and felt very secluded amongst the late redwoods. The hotub was fantastic in the cool autumn night and the fire pit was great too! Picturesque in every way!! The home was clean, and they even gave us a free bottle of wine. The beds were not the greatest, but not too bad. The only other downside was that the fireplace chimney must not be well maintained because there was a fair bit of smoke filtering into the cabin so we were unable to enjoy that feature. "Place to relax with enough activities close by." The house is very nice an cozy. Gives a cabin feeling with the fireplace and wooden décor. I loved the big windows to the deck – which united living area and the deck. The deck is spacious with great view of the surrounding trees. One side of the house is very close to neighbors (the corner of the deck is overlooking the neighbor’s yard, but most of the view is blocked by fence). It was not a problem for us and there was nobody at the neighboring house during our stay. On the other side you can’t see neighbors because of trees. There are steps down to the creek, but there was just a small puddle of water when we stayed, I guess it was not the right season. The house also offers nice Jacuzzi. One thing to be aware of is the fireplace inside the house. Upon starting, it releases some smoke into the room (event when vents was fully open). Judging by the fireplace it happened before. It made our dog uncomfortable and we decided not to bother about fire inside the house. But you might want to get more instructions from the management on better methods to fire up the fireplace. There is also a fire pit outside for outdoor fire. "Can't have enough of Casa Verde"
Not sure how many reviews anyone is allowed to write for one place ,but I feel this cabin deserves that each year we go ,we need to say something nice. It was another wonderful vacation with the pups that will be memorable, and again will have to dream for another year for our return! The comfort, the beauty of the place and the surrounding area the smell of the redwoods and gentle flow of Austin Creek is imprinted in our hearts. Thank you all at Russian River Gateways and as always many thanks to the owners for taking such a good care of your guests and the property.Marylou, Noah and Abi (the pups). My husband and. I have been fortunate enough to enjoy Casa Verde yearly for 4 years now. Our children and dogs love our "creek house vacations". Everything about this home is well done and perfectly thought out! The house looks just like the photos. It has an open living/kitchen/dining layout. It has a rustic/modern/cozy feel. Having the extra bedroom for one couple was actually really nice as the rooms are a bit small. So we left our luggage in one room and slept in the other. The kitchen was fully stocked which was a pleasant surprise because some reviews made it seem like there weren't too many items. There were a few minor issues upon our arrival, such as the garage door being jammed and not able to access the washer and dryer, blinds in the bedrooms were also stuck and did not come down (had to cover the window with a sheet first night), and hot tub was not on, but the after hours line answered and were helpful - they sent a maintenance person over the next day to fix the items. Overall, it was a great stay and the house was really great. If you are looking for a completely secluded place, you can see and hear the cars off Cazedero highway when on the deck, so it's not 100% secluded, but there is barely service (wifi worked fine) so that made us feel "off the grid". I'd recommend this house and would book through Russian River Getaways again. They were helpful, accommodating and had great recommendations. We spent our honeymoon at Casa Verde. it is a great secluded location, but close access to the coast, wine country, and more! Highly Recommended! We stayed here 3 years ago with friends. Wonderful, relaxing! quick access to the creek. Gated area was perfect for having little kids and dogs. Property very clean. Would stay here again. We fell in love with the area. Arrived on a Sunday afternoon with the dogs. Place was clean and in good condition. Part of the backyard is completely fenced in and dogs loved it. Hot tub was nice, clean and added the perfect touch to a relaxing getaway. We picked a non peak time, so an additional night was added for free. Besides a bit of construction going on next door one day, it was very very quiet and we enjoyed the sound of the creek. We are already planning another visit and hope to stay at Casa Verde again. Calm, quiet, like being at home. A well priced cabin thick in the redwoods on the way to Cazadero; all the amenities provided including gated yard for the dogs. Perfect open deck with stairs and path down to Austin Creek for leisurely walk with the dogs. Central to everything Sonoma County has to offer. At the first moment we open the gate to the property we were breathles;we thougth is a piece of haven forgoten on earth!We spent there 5 days and beg the time to stop!Absolutely charming,from the big picture until the last detail. It felt like invisible hostess were around, making each of our wishes come thru!Not sure now how to fast forward the time until next year to go back again.The place was well equiped with everything,clear instructions and very clean.What a pleasant experience! And as for our puppies,they did enjoy every moment.We explored the area,Jenner,Johnson Beach,Duncan Mills,Armstrong Woods and others not so known places by turists ( the locals there are very frendly and tip us on the secret little oasis over there! ),but the only place we want to return was Casa Verde.We open the gate and beatiful austin Creek was just there for us to walk and enjoy the serenity! Swimming holes were waiting to be discovered by playfull pups! How much fun was for them as well!We sadly returned to the urban life but we have one of the most beatiful memory and can wait for next September when will be back.Thank you Russian River Gateways and thank you to the owners for the way you maintain this place! Is a jewel! We had a great time at Casa Verde! the house is small, but adequate. it was great having the fenced in yard and being able to allow our dog to run around unattended. And who doesn't love a hot tub!? the only down side was the house had obviously not been cleaned in a while. things were very dusty and the carpets needed to be vacuumed. Next time we may opt for a house a little further east. Cazadero is a cute little town, but a little too far west, and gets some of the lingering foggy summer ocean weather. I've been a frequent visitor of Casa Verde for the last 9 years. Over the years the process has changed to check in, stopping at the office to getting the keys, to email/pass Code entry to the home. I found the current mode very efficient, but I do miss the interaction of visiting the office and getting/dropping off the keys. Don't ask me why, but I just do. There was something personal about saying hello and such. Casa Verde has changed over the years too. All of it great changes. The bathroom and Sky lights in the hall were a big improvement. I remember the original bathroom still. Over all I just loved coming in and smelling the fire place and the light that came in from the deck. I always thought it was slightly over furnished inside, but nonetheless comfortable. I think getting a smaller dinning room table would help, give more space. Kitchen is always well stocked with cooking utensilsIt feels secluded and I love that. The sun always warms up the house.It was very clean when I arrived.The hot tub area probably needs to be fixed up a little, but still wonderful.I keep coming back and will continue to do so. Well, next time you rent from us please feel free to come in and say hi. It's our guests like you that keep us doing what we do and we appreciate your loyalty and repeat business. Casa Verde has definitely had some great improvements over the years and the location makes for a peaceful stay. The spa area is a bit rustic but it's part of the charm of the property! As for the dining room table, it has been moved sideways and it has made an enormous difference! We're so happy you love Casa Verde and hope to see you again soon. "Peaceful, Serene, quiet and amazing!" We didn't receive any services. We loved the home! Dogs are allowed big plus! There is a hot tub- big plus! Tv's in every room! Dvd player with quite a great little selection of movies! I liked how they had everything! It was just like my home. They had a blender, tons of dishes and a BBQ grill which worked great. As far as the location I was a little disappointed, I was hoping there would be a place for my boyfriend and I to run, but the roads are incredibly narrow and dangerous, too dangerous for us to run on. I tried a gym on 116 on the way to Safeway, but they didn't accept cash, so I couldn't even go in. It's basically an old house turned into a gym. I liked everything about the house! They had tons of extra blankets and even a dog bed! However we didn't find the dog bed til our last night, because the previous renters hadn't left it where it was supposed to be and said to be in the rental guide book. The lay out of this house is awesome. There's a perfect size kitchen and it connects to the living room so my boyfriend and I could still interact. The only thing I didn't like was the size of the couch. I also wished that there had been more room for our dry food, all the cabinets had things in them. The other thing I wished they had was a gate that enclosed also towards the river so that the fireplace was the enclosed and we could have used that so our dog wouldn't run to the river. I also wished there was either a treadmill or a place in the handbook recommended where we could run. Although our last day we did find out that there was a track at a local high school but we never made it. My small family of my finance,&amp; dog all recently stayed at Casa Verde. It was a peaceful, rejuvenating, weekend surrounded by beautiful red woods. We live in the city and needed to get away from the hustle and bustle of loud traffic, sirens, and car horns, and couldn't have picked a better spot! We had breakfast on the deck every morning and listened to the birds chirp. We found an amazing swim hole as we walked down the creek that was completely private! The kitchen was completely stocked with all the cooking supplies you could ever need! We cooked every meal with no problems. The grill was perfect and ready to use with charcoal available for use, wood on hand for the fire pit, and a warm bubbling Jacuzzi surrounded by redwoods! The inside of the house was nicely decorated with nice fluffy towels and a very comfortable bed. We will come back to the Casa Verda alone and maybe bring friends too! Perfect for both! I was really wanting a float to relax on the creek in the sun, but didn't find them until we were leaving! So look in the garage if you would like a float to relax in the river on! This place is terrific! We've rented a lot of houses over the years and this is the one that we will try to reserve from now on. Not only is it a great location right on the creek in Cazadero, but it also has good kitchen equipment, nice furniture, comfy beds, a sunny deck, and a fenced area for our dog ... pretty much anything you could possibly want in a vacation home. Oh, and did I mention that there are two bakeries nearby? My husband and I and our three dogs had a great time at Casa Verde. It was very relaxing and is perfectly set up with everything we needed and more and for vacationing with dogs. I highly recommend Casa Verde. "The only thing that could have made our stay better was the Sun-"
Despite the deluge of rain, our time at Casa Verde was perfect! Such a cozy well appointed cabin in the woods! The fenced in yard was Great--the dogs loved it! The spa is in a perfect location under the trees--although we didn't venture out to use it due to the rain--next time! Also would have loved to sit by the outdoor fire pit--another thing to look forward to next time! The deck was great--we even managed to eat our breakfast under the patio umbrella without getting too wet--the view of austin Creek (which was more like a river due to the rainfall) was stunning! The property was private, and quiet--just what we were looking for! The fireplace was large and provided lots of warmth and light. The beds were extremely comfortable. You could tell the owners of this cabin (Mario &amp; Greg according to the guest book) took great pride in not only the decor (all the lamps were gorgeous and perfect for the cabin feel) and furniture, but stocking the kitchen and closets with just about everything you could want to make your stay comfortable--even a dog bed (and extra dog bowls) for our pooches! About the only thing we needed but didn't find was a medium and a small pot (found the lids, but couldn't find the pots); they were probably there, but we made due without when we couldn't locate them. We can't wait to return--we are making plans now! ;o) Thank you Mario &amp; Greg! You've got a jewel of a cabin tucked away in the Redwoods--we can't wait to be back! My husband, doggy and I have stayed in several other places in the Russian River area, but the Casa Verde house was the best! It was a nice house, very cozy and well stocked with all the necessities. The yard was fully fenced, very important for us dog parents. We all enjoyed the creek located just steps from the house. We loved it so much, we have already booked our next weekend getaway in Casa Verde. "Our annual stay at Casa Verde." We love this house! We have stayed at this property for most of the last 12 years and go back every year because of the location &amp; the fact that it feels like home to us. We love the totally fenced yard for our pup, the quiet and unpretentious home &amp; location on austin Creek. It is the one week we get away and totally relax and enjoy the time together. Our pup loves it too! "Nice sunny deck and access to nearby swimming holes." We had a very relaxing stay. We really enjoyed the sunny deck, nearby swimming (especially the dog!) and hot tub under the redwood trees. The neighbors are pretty close but the trees and fencing provide adequate privacy (this is California after all, what do you expect?). Overall, it was a great couple of days and we left feeling relaxed and rejuvenated. Would recommend to others. "Fantastic and it delivered all that it promised." Great stay in an amazing location in a very comfortable and well equipped home. My dog and I had a very relaxing and fun stay. "Our Do didn't want to leave this slice of Heaven"
What a fabulous and relaxing 4 day stay we had in this lovely creek side home. We brought our american Pit Bull Terrier and he turned out to be quite the water dog indeed.There was a small swimming hole just at our back yard that he would play and swim in until he was exhausted. Then nap on the sun drenched deck while we relaxed w/wine and our favorite books.Great attention to detail. Lovely furnishings and comfy beds.It's obvious the owners love to cook, as do we, by supplying every pot, pan, cutlery and appliance one could think of.We can't wait to come back! "Our Dog didn't want to leave this slice of Heaven"
We had a great time at the house. The main issue was the neighbors that were actually "residents" living next door. When we arrived, they were using a chainsaw, their property is littered with washing machines and trash which made it hard to open the blinds in the rooms. The fact that it's on two main highways is a bit of a bummmer because there are big trucks and a lot of traffic. Other than that, the house was lovely, so was the deck. The property was beautiful and the greenbelts and forest were amazing. I would recommend less furniture in the house and a much bigger sofa. "Wet and cold in the month of March, but comfy at Casa Verde"
Let's start with the negatives. I had no internet, phone or cable for the 6 six days I was there. I was told there was a power outage the day I arrived and the swtich had to be reset as one company controlled all three services. This never happened. On the surface everything was clean until you went under the counter to get an appliance that hadn't been used in a while and found it dirty and sometimes in disrepair. There were a few ants in the drawers and on top of the counter tops.The hot tub area was also an issue. No one had done any landscaping around the tub and, as such, there was fallen debris everywhere which made it difficult to put the cover on and off. And the last negative, having a leather couch in cold weather is not a good idea.The good stuff. The staff were very friendly and helpful both when booking and when I went in to complain about the services, although the weather may had had some part in keeping things operational. The cabin's main room was warm and cosy, except for the leather couch, but after a fire was started and blanket was put over the couch it was perfect. The forced air heat worked very well if one didn't want to start a fire. For a couple it would have been a very romantic getaway. The bedrooms are pretty standard as is the bathroom, although the stand up shower was well done. The best feature is the stone fireplace, which I used everynight. The deck, had I used it, would have been perfect except it lacked a gas BBQ for added convenience. I thoroughly enjoyed my stay and would come back and at a time of year that wasn't so wet. I knew this going in, so there was no surprise.I went there to cycle and found the roads to be perfect. Many options for both advanced and beginners. I spent lots of time with the locals at local eateries and bars and found all to be friendly and helpful. Overall, there area was beautiful, the people were friendly and with a few minor adjustments the cabin would be perfect. Were so glad this gentleman discovered so much to enjoy about his stay, despite the challenges of arriving on the heels of some seriously stormy weather. After the initial power outage, the lack of phone, internet and cable was our fault. We had so much going on with power outages and post-storm clean-up and repair, we did not get someone out there to reset the switch for him. Unfortunately, after the first day he came to report the problem, he did not contact us again, so we didn't realize the error until after he left. We deeply regret this, and have offered him a future stay with us at a good discount. The ants came with the rain and left just as quickly; no sign of them since. This house has also been deep cleaned so the cabinets are clean, inside, as well as outside. We did not find any appliances to be broken. The outside debris was from the storms and has now been cleared. "Another great stay at Casa Verde"
This is a fantastic house -- nicely appointed, right on the river, and great for a dog due to the fenced-in yard. We'll be back! We have stayed at Casa Verde for the last 10-12 years, and we love this house! The fenced yard is great for our pup to run around and explore, the huge sunny deck is great most any time of day, but especially for cocktail hour. We like the location better than being in town, and it's close to some good restaurants. But mostly we like it because it is relaxing and comfortable for the one week we spend here every year. The only negative I have is about the management company, and not a reflection on the house. We rented this home through a previous management company who always remembered us each year when we booked the house. We have rented from this current company since they have been managing the property for several years and yet feel like strangers to them. The house is why we return, not the rental company, but still it would be nice to feel a bit more appreciation for returning year after year. We are really baffled about this comment about our management company. We have had this home in our listings for seven years and we have always happily welcomed these guests back. Because we have keyless entry at this home, we no longer check guests into the home so we don't actually see the guests at all. Not sure what we should be doing that we are not doing. "Nice spot - weird contract"
We really enjoyed Casa Verde --- cute home. It had quite a bit of street noise, but my kids and husband didn't seem to notice it. I found the contract completely offensive. It requires you to obtain written permission for up to 2 daytime guests. I have never seen anything like it. The agent kindly explained that they have had problems in the past and it was fine to have my 84 year old mother over for dinner. I still think their contract is harsh. We enjoyed the setting, amenities and secluded nature of the property. Great for families and dogs! The creek in front of the property is small, but a little bit north and south are deeper/wider areas. Deep enough for the kids and dog to swim. The area just south has an area deep enough for an adult to submerge. The area north is longer so we were able to paddle our inflatable raft around. And even further north there's a huge boulder, apparently put there by mother earth for people to jump off of (there's also deeper water there).Other nice surprises. I didn't know the access to Russian River (River Road) was close to so many great wineries! Alas, one of my favorites Joseph Swan only does tastings on the weekends and we were there in the middle of the week, but good to know for next time. Cazadero is a cute little forest village, perhaps a little far from stuff vs Guernville, but perfect for getting away from it all. Raymond's bakery in Cazadero is fantastic (get their baguette! ).Russian River Getaways does a great job. Our place wasn't cleaned when we got there, so the cleaning manager Mike waived the cleaning fee and sent someone right away. Gave us our choice of a Beringer Chardonnay or Sauvignon Blanc (I think they do that for everyone not just because our place wasn't cleaned), nice touch.Overall, great getaway and I'll definitely be renting from Russian River Getaways again. And hopefully staying at Casa Verde again! "the overall tone of your rental agreement is unwelcoming!" we enjoyed our stay here but i must say that the feeling your rental agreement inspires is not welcoming. also the fact that you have to call and get permission to have extra day guests and the threatening tone about charges for exceeding the number of staying guests made me feel ill at ease with the entire situation and as if we would be watched. i wonder if all that is necessary? it's so unfriendly. i especially did not like the lines about how we might wind up on the "do not rent to list" if there was evidence of our dogs having been on the couches or left alone etc. why don't you start out assuming the best about your renters and approach us that way? honestly, i did feel like i would not rent from you again for this reason so you might want to think about that! I took a chance on Casa Verde and spend my 40th birthday there. After 5 seconds I came away with this impression...Casa Verde is a incredible house. There is two charcoal grills(on a magnificent deck), a jacuzzi, a fire pit and a path that leads to the creek. The creek is walkable and ankle deep, however, we found a few spots that were a little over 6 foot deep. Perfect for basking in the hot Sonoma sun with a cold one in hand and dipping in the deep part of the creek to cool off! The house has everything you will need to cook with and wifi and cable too! The pictures don't do this place justice. I guess the house is just not photogenic(maybe it just wants to stay Sonoma County's best kept lil secret gem?!). Trust me. Photos be damned! It is awesome! Smack dab in the middle of a killer redwood grove. Cazadero is 3 miles up the road and has a little store and post office...that's about it! But you didn't come up all that way to hang out in Cazadero...did ya? It is absolutely perfect for getting away! The only drawback(if you want to call it that) is the neighbors have a rooster. Just bring earplugs or drink an extra glass of wine before bed! If you are contemplating Casa Verde...my suggestion to you is, do it! You'll love the relaxing environment and it is a superb place to recharge the batteries. The big redwoods and austin Creek in my humble opinion make Casa Verde a little slice of heaven! Enjoy! We loved the location of the Casa Verde. The kids loved playing in the creek, we enjoyed the hot tub every evening, and it was very pet friendly having the gate blocking the highway access. We enjoyed ourselves and would come back in a heartbeat! Truly, there is no problem with the fireplace. The fireplace grate was simply placed too close to the front of the fireplace and we didn't realize the problem right away. Haven't had a problem since this simple solution was implemented. "Lazy Summer Days in Casa Verde"
My husband and I recently took our two children to the Russian River area for an end-of-summer mini-vacation &amp; we stayed in Casa Verde. The house is absolutely adorable and perfect for a family of four. We had fun taking walks down the creek, having s'mores in the back yard fire pit, and enjoying the hot tub. The kids woke up every morning and went down to the creek and played for hours. It was the most relaxed we had all been in ages (the rooster was not that bad). We have only two complaints: 1) the cleaning service should be doing a much better job! The house was so dusty all over and the floors had a lot of dust and dog fur under the beds &amp; all around the furniture. We ended up cleaning it ourselves. 2) We wished the sliding glass door had a screen on it. The night we arrived there were dozens upon dozens of flies hovering around the kitchen and we spent our first day on a mission to rid the house of flies. We kept the sliding glass door closed the rest of the time. However, the home and all it's charm made up for all of this. We loved it there and think about our stay all the time. Photos on the RR Getaways website do not do Casa Verde justice. It's sited on the banks of Austin Creek: perfect for late afternoon wading with the dogs. The bedrooms are cozy, and the bathroom is small but was nicely updated. The kitchen is well stocked with appliances, and we made good use of the grill. I'm already making plans to return in the Fall! The house was a perfect getaway! Clean, Cozy and well equiped... Loved the large windows with view of the river, the towering redwoods around the property, the well kept landscaping, etc. There were few problems with the house, not even worth mentioning here because we love this place and will be staying again very soon! This was our 2nd stay with RRG and our 1st at Casa Verde, and we were again impressed at how clean and well-maintained the property was. The property is completely fenced - even the back facing the creek - so once the gate was closed &amp; the dogs hopped out of the car, they were completely secure. Going up the stairs &amp; into the house, the living area was intimate &amp; cozy, decorated in a tasteful Craftsman style, with hardwood floors, a working stone fireplace, dining table seating 4-6, gorgeous flatscreen TV and assorted books, DVDs and games. The entire back wall facing the creek was windows, for a expansive view of trees. The kitchen (part of the main room) was impressively stocked with high quality appliances &amp; cookware. The bedrooms were cozy &amp; sensible, both looked into the neighbors' yard so we kept the blinds closed. The bathroom was nicely remodeled &amp; modern with a dark granite shower with glass door. We didn't use the huge deck due to rain, but the dogs used it to spy on the neighbors' rooster just over the fence. The hot tub was surrounded by redwoods and fairly private being situated on the other side of the house from the neighbors. We didn't try accessing the creek because the bank looked steep and densely vegetated, but the sounds &amp; view were fantastic. We would rent here again for the view, the hot tub, the tasteful interior and great kitchen, and the dog-proof yard. A relaxing &amp; much needed getaway.